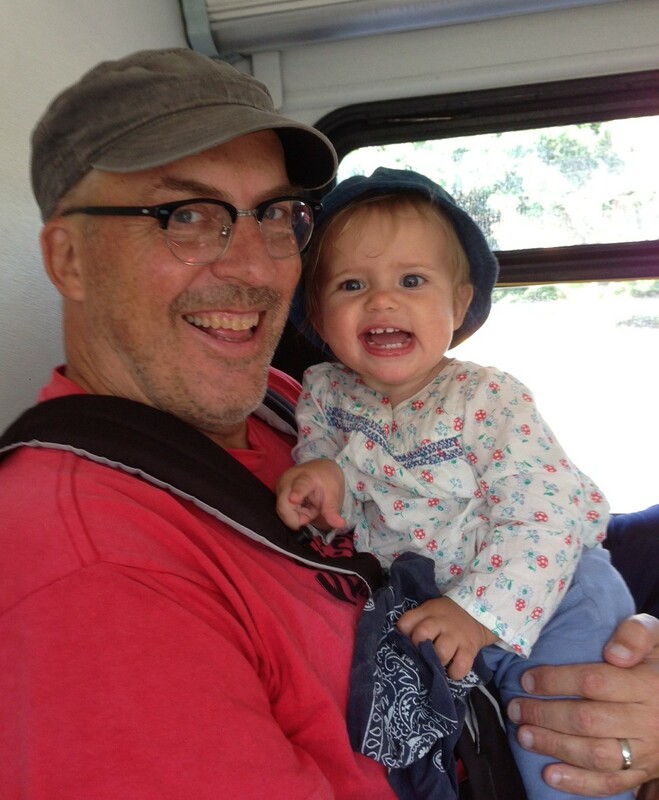 The author riding the bus with my daughter Maeve. Photo: Carrie Lincourt/Streetsblog L.A.
My one-year-old daughter Maeve isn’t riding a bicycle just yet. Both her parents are cyclists; our first date was on a bike. From when I moved to L.A. in 1996 through 2012, I lived here car-free. I mostly bicycled, but also walked and rode transit. I fell in love, temporarily moved east, got married, and had a kid. I returned to L.A.’s Koreatown in February, when I began writing full time for SBLA. Using the categories from the renowned Portland study that characterizes different types of cyclists, I think I am part of the “strong and fearless” 0.5 percent of cyclists who will ride pretty much anywhere. My wife is more along the lines of “enthused and confident” 7 percent of cyclists who ride in the city regularly. I think the arrival of our daughter has pushed my wife further toward the “interested and concerned” 60 percent of the population who like bicycling, but really require facilities, and prefer quiet streets or bike paths. Despite my wife having logged plenty of urban bicycle miles, she doesn’t trust that our daughter will be safe on busier L.A. streets. For the first seven months of Maeve’s life we lived car-free in downtown Jersey City, NJ. It’s essentially a very walkable transit-oriented extension of New York City, so we walked and rode subways, occasionally using Zipcar. Since we moved to L.A. in February, we’re a one-car family. I still bike all over when I am on my own. As a family though, I’d guess that just under half our trips together have been walking and taking transit, and just over half the time we drive. During the first year of a newborn’s life, Los Angeles active transportation options are somewhat limited. Though I’ve heard that people in places like Holland do bike with very young babies, the American Academy of Pediatrics recommends not taking your kids on bikes until they are at least a year old. Very young infants apparently don’t really have sufficient neck control. It may or may not really matter, but I made sure to do a lot of tummy time early on, which I think helped get Maeve better neck strength. Though I was chomping at the bit, we did wait until Maeve was just over 11 months before we took her on her first trip in our bike trailer. More on that story in a future #streetsr4families article soon. The map on our fridge (cut from the Metro County Bike map) showing a 2-mile radius. Photo: Joe Linton/Streetsblog L.A.
One tactic that my family adopted is that we posted a map on the refrigerator in our kitchen. We drew a circle at a 2-mile radius from home. Any destination within two miles, we can easily bike, walk, and/or take transit, so we leave the car at home. For stuff outside the circle, it’s ok to let ourselves off the hook, and drive if need be. I didn’t invent this – my friend Chuck Arnold told me about doing this when he and his wife had kids. If anyone out there knows who originate this practice, let us know in the comments below and I’ll acknowledge the source. We don’t check the map all the time, but at least my wife and I agree on parameters. I don’t get to nag her about taking transit into the next county. She’s cool with walking to nearby destinations. The technique is adaptable to other locations. Perhaps your family only wants a 1-mile radius, or less. I think the map circle helps us realize just how short a lot of trips are. Hollywood Boulevard is only two miles away; I would have guessed further. Why bother? Why not just strap infants into car seats and worry about the bike stuff when she gets a bit older? My favorite response for this is from Chuck Marohn of the must-read Strong Towns. I recommend reading his full article Do we really care about children? Also listen to his Car Seat Nation podcast episode which covers similar ground. Though car seats are safer than no car seats, they give the impression that driving kids around in cars is safe. It is not. After complications around birth, car collisions are the leading cause of death among children under 20 years old. Every year more than 4000 kids (just in the U.S.) are killed by traffic violence. So, when we get into our car, we are taking a risk with our daughter’s life. It’s a relatively small risk, sometimes seemingly unavoidable, but it is a risk. And the more we drive, the more the risk. I think in general we mentally over-estimate the safety of car transportation, while over-estimating the dangers of other modes, especially bicycling. When these perceptions cause us to drive more and bike and walk less, then we increase our exposure to the small risk. On top of that, we contribute to a system that increases the dangers to our family and indeed to everyone. I would estimate that my girls [Marhohn’s too-young-to-drive daughters] take between twelve and twenty [car] trips a week. Average round trip: probably ten miles. Sure, I put my kids in car seats, make sure they are buckled according to manufacturer’s specifications, drive according to posted limits, always signal my turns, etc… but what I am doing putting them in a car so often? The answer is that I am an American, so I drive everywhere. In my town I really don’t have an alternative. Even the people who live in the traditional neighborhoods have to drive out to the edge of town to get groceries (don’t worry, the city has spent millions making that trip fast and easy). But is this really acceptable? If we are serious about wanting what is best for kids, shouldn’t we be doing everything we can to reduce the number of auto trips people are required to take each day? And when people do take trips, shouldn’t our top priority be reducing the travel speeds on local streets? Once outside of the local street network, shouldn’t our top priority be the removal of the greatest source of accidents – intersections – so traffic can flow smoothly? The best thing we can do for the safety of our children is to get them out of the car by building mixed-use, walkable neighborhoods. By staying out of a car for shorter trips, we’re voting with our feet–for more walkable, safer neighborhoods. Stay tuned to Streetsblog LA’s handy hashtag “#streetsr4families” for ongoing coverage on kids and livability. L.A. isn’t currently a family-friendly city. Look at the catastrophically low number of four-bedroom houses (less than 10%), look at the schools, look at the transportation. Forget “streets are for families” – we need a broader L.A. Is For Families movement. Couldn’t agree more! My husband, our 3 year daughter and myself often choose to bike or walk over driving. The diversity of experience and interaction with neighbors and our community is a tremendous learning opportunity for the little one. Low stress cycling can usually be done on a lot of residential streets and bike paths. Unfortunately, there are very few of those that connect into a complete route. A link in that route that exceeds a persons tolerance for stress can make the whole route useless to them. I had to do some trial and errors to find low-stress bicycling routes in my neighborhood to recommend to those that have a low tolerance for traffic. I’m surrounded on three sides by busy streets where I live, so there’s not much choice for fairly direct low-stress bicycling routes. Incidentally although many bike advocates prefer Class IIs (bike lanes) on major streets, sometimes a enhanced Class III on a parallel side street works out better for family riding, since they don’t have cars whizzing right next to them. A cycletrack works even better, but there is also the concern about cars turning in and out of driveways on a busy street, such as the new Rosemead Boulevard cycletrack. 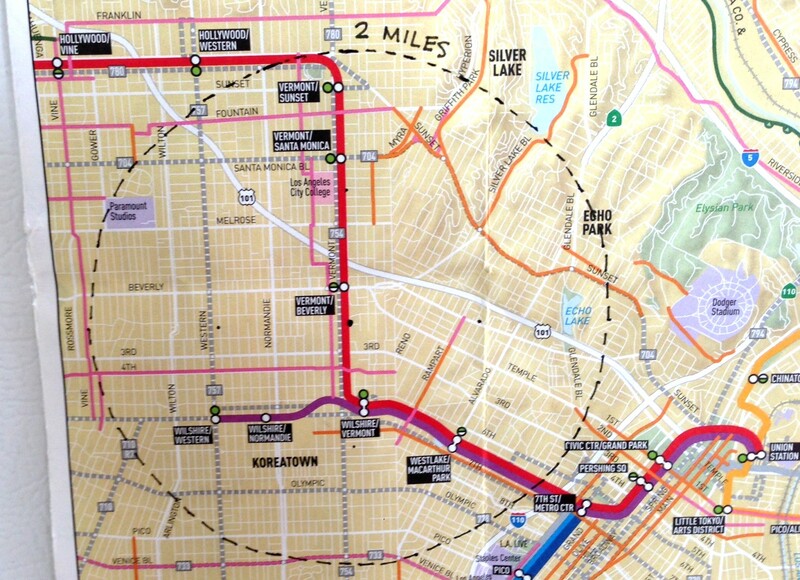 If L.A. Is Going to Invest in Bike Lanes, Then Do It Right!